A while ago, one of the companies I use had a very cheap DVD sale on, so I picked up quite a few films blindly cause I thought they sounded good. Jiang Hu was one of those films. I can honestly say though that I would never have imagined that I would pick up a gem like Jiang Hu in such a cheap sale. I just love going into films without knowing anything, mainly what sort of tone and approach a film is going to take, as that way I can really appreciate a film more, as I have no prior expectations. In this case all I had to go on was the name. Being called Jiang Hu ~ "The Triad Zone" did make me think I was going to be watching a typical triad film. Well that is what this is, but it isn't... Yes, I know that doesn't make sense, so to clarify, in story Jiang Hu is a fairly typical triad film, but the way the story is told and the tone of the film set it apart from every other triad film I have ever seen. So story sum up first. It really is simple so I won't go into paragraphs of description. An triad underworld boss Jim Yam (Tony Leung Ka Fai) receives a tip from a trainee police officer (Eason Chan) that someone is going to try to kill him in the next 24 hours. It is then up to him and the people around him to find out who the assassin is, and why they are wanting to kill him. In fact, that is the main story covered. As you would expect there are many sub-stories and plot threads in the film, but I'm not going to go into them at all, as if I tell a little about one, I'll have to tell a little about them all, as in one way or another they are all linked. As you can tell from the brief plot summary, what I stated a couple of paragraphs up is true, story-wise Jiang Hu is a fairly typical triad film. What I was not in the slightest bit expecting in the film was the humour. There are some completely laugh-out-loud hilarious moments in the film. It isn't all the silly slapstick humour that plagues so many serious films in Hong Kong cinema either. Granted that type of humour is also present here but with a difference, and that difference is that in this case it actually works (bar one bit, which I'll cover in a moment)! Early in the film I found the humour to be very subtle in style, and clever in delivery. The scene was acted and played seriously, but the actions or speech or whatever that was going on were very comical in nature. This contrast made it even funnier, in my opinion. The same contrast can also be said for the film in general. This is a serious film, with some very violent scenes, yet the comedy for once compliments the film almost perfectly. Whether it is the subtle comedy, or the outright slapstick, large amounts of kudos have to go out to the scriptwriters and the director for handling it all so well, and not leaving a mess of a film. For me there is one scene which in itself is funny and entertaining, but ruins the flow of the film a little. It is the scenes involving Master Kwan (a Chinese God?). Jiang Hu is a serious triad film despite the comedy elements, but bringing in mystical things like Master Kwan ruins the impact of the serious side of the film. I can't really find the words to explain clearly what I mean, so apologies for that, but if it weren't for those scenes I think the final product would have had a little more credibility. With a film such as this, and the contrasting elements that are present, to make the film work required more than just a good scriptwriter and director. Bad performances from the cast would have probably made the film sink badly. Jiang Hu, however, is floating very highly as every performance is of a very high standard. 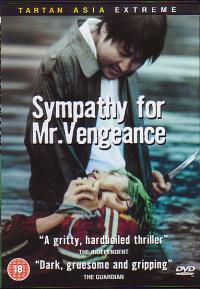 I watched this film not long after watching Ghost Lantern which also stars Tony Leung Ka Fai. In that film I found his acting to be not that great in some places. Other scenes restored my faith in him, but any doubt I had has been completely erased after this film. He just handles everything so well. His Jim Yam is an incredibly cool character, who handles pressure from his position very well. He is authoritative and deadly when needs be, but also emotional. His comic timing and reactions are also tested frequently and again he rises to the challenge. I really don't have much to fault him on here. The same can be said for his opposite number Sandra Ng. She is Jim Yam's wife, and also brilliantly shows the full range of acting abilities, as is pointed out by the narrative from Jim Yam when her character is first introduced. From the emotional wife, we quickly see her being the stone cold serious triad. The chemistry between the two is also quite believable. From the many flashbacks in the film, we see how the two met, and basically the story of their lives after that point charting the highs and lows, giving them both depth that isn't frequently concentrated on in other film. I have reservations on whether the film would have functioned quite as well had there been a change in the lead casting. For these roles Tony Leung Ka Fai and Sandra Ng are perfect casting. The next main character is probably Roy Cheung as Jim Yam's bodyguard Yue. His character is the strong, silent type. His loyalty and devotion to his boss is staggering, and he (as usual) does come across as a right hard b@stard, although this time someone with more depth and emotion than in a lot of his other films. 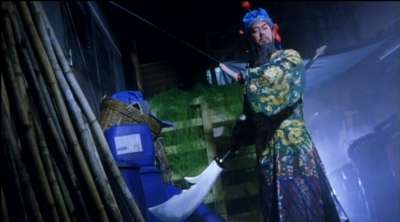 Anthony Wong's role is as Master Kwan. Those are the scenes which I think detract from the overall effect of the film, but are still really good scenes in themselves. In the modern setting, Anthony Wong brings a touch of the traditional Chinese character. The long beard being stroked, the bowing as a greeting to everyone whenever he can, it is all there, and convincingly so. Despite all the modern distractions around him to tempt him to be more contemporary in approach, Wong still gives a performance that would not be out of place in a period film. Again with the contrasts, this adds to his performance and makes it very memorable, regardless of what I think of the effect of the scenes as a whole. Of the other many cast members that turn up in the film, there are only two more which I'll comment on. First there is the young triad Tiger, played by Samuel Pang (I think this was his first major role). He is a charachter with ambition, and a desire to be great in the triads. Despite being young, he already has the respect of other members in his triad. Pang gives a very strong performance as the ambitious Tiger, and it is a shame that more depth wasn't given to his character. Lastly there is one of the more interesting characters in the film, Yam's consiglierie Wai played by Chan Fai Hung. He is very much a quiet secretive person who, despite working for Yam, isn't part of the triads. His character comes across as one who actually has a lot of depth, even though this is not looked into in the film. Most of the character impression, for me, came across in one scene where Yam visits Wai in his house. In that scene there is a voice over from Wai where he states something like "working for Yam is just a job for me, and I have other bosses"... or something to that effect. I may be badly off with the wording, but it was that sort of idea he put across. While it shows that Wai doesn't have the loyalty of the triads, it fits in very well with the quiet nature of his character. Anyway, both Chan and Pang give very good support performances. Jiang Hu is a film very much like Infernal Affairs in that it is very much character and story driven. There are some action scenes which are handled well, and while necessary to the story, they are not the focus of the story. Even in these scenes it is not the action which is the fore front of attention, it is still the characters, their interactions and emotions. 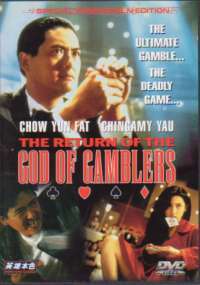 Helping to portray these feelings to the viewer are regular voice overs from many of the film's characters, primarily Jim Yam. The viewer is brought into his world, and is able to understand his actions and see him in better light as a result. I don't really know what else to say about Jiang Hu. It really is an outstanding film in my mind. The clever script, interesting and human characters, good direction and stellar acting have made a film which I think all fans of Hong Kong cinema should see and marvel at. Given all the things the film tries and melds together I would have expected an incoherent farcical piece of rubbish to be honest, but no, that is not the case. 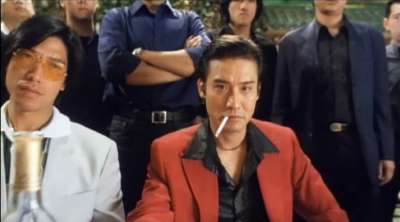 Of all the Hong Kong films I've seen in 2003, I think Jiang Hu ~ "The Triad Zone" has an easy place in the top 5. Jiang Hu features an adequate Cantonese DD5.1 mix. It spreads some sounds round the speakers, mainly the more ambient things though. However, it also has some sounds coming from the surrounds which definitely shouldn't be. For example, there is a scene where the person on screen flips open a cigarette lighter and lights his cigarette, but the noise for the lighter was spread to the rear speakers as well... The majority of all sounds and speech came from front centre. Like a lot of the soundtracks on early Mei Ah dvds, there really is nothing special about this one. Everything is clear enough and audible, and the volume balance balance between the speech and sound effects is decent, but there isn't anything which makes the soundtrack have that "wow" factor. The subtitles are removable ones, which is a relief. Much to my surprise though, they are also very good. Throughout the entire film, I only recalled seeing a handful of grammar and spelling errors, which is better than the usual! However, there are still criticisms. In some places the subtitles are definitely too quick, as I had to rewind the film to get a second chance to read them on a few occassions. There are also an instance or two when there were Chinese characters on screen, but unfortunately not subtitled. On the whole though, the subtitles are really quite good. The transfer for Jiang Hu is letterboxed, but it very quickly comes apparent that the film is not in its original aspect ratio. When the film's title screen comes up, the title doesn't fit on the screen, as part of it is cut off at the sides. This leads me to believe the film has been cropped. For an older Mei Ah release, the transfer is quite surprising in that it is pretty good! The print is general clean throughout the film, with only the odd speckle here and there. Grain levels don't seem to be that bad, as I didn't really notice anything that distracting from it. Colours looked reasonably strong on the whole and detail levels are also good for a letterboxed transfer. For extras Jiang Hu offers nothing special. There is a Cast and Crew section, and a film synopsis, both in English and Chinese. There are also trailers for Jiang Hu and for the Hollywood flick U-571. That is everything. Overall I was really quite shocked after watching Jiang Hu. Shocked that I hadn't really heard so much more about the film, and that I hadn't bought it in the past. To think I only bought it because I saw it going really cheap. The film blends all its elements (bar one section) together exceptionally well, and the final product is a film which in my mind is different to most other triad films which I've seen, even though the storyline isn't a million miles from a lot of others. I rate this film very highly, and it is one of the better Hong Kong films I've seen in quite a while. If it weren't for the effect to the overall tone and mood of the film from the Master Kwan scenes, I would have given it a 4.5.